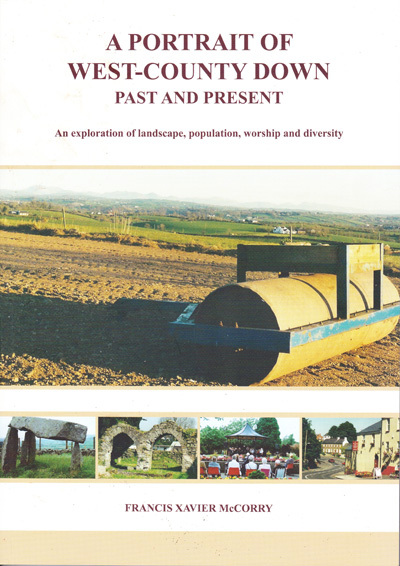 A Portrait of West-County Down Past and Present: An Exploration of Landscape, Population, Worship and Diversity. Francis Xavier McCorry is something of an enigma among Irish historians. A physics teacher by trade in a previous life, he has forty years of local history publications under his belt. Perhaps not as well-known as he should be outside of his native Ulster, he counts a number of well-respected historians such as Cormac O’Grada as admirers. This, his latest (but not last) book, published at the age of seventy-five, sees McCorry, rather than slowing down, undertaking perhaps his most ambitious project to date. The subject of McCorry’s latest study, a history of West County Down, is indeed niche in terms of its geographical and historical scope. It is certainly not the most fashionable of areas for research, and often is overlooked by the more romantic south of the county, ‘where the Mountains of Mourne sweep down to the sea’. That said, there are many parts of West County Down which have a rich history dating back a millennia and are more than worthy of note. Painting a picture from its earliest modern settlements, pre 12th century to the mechanisation of farming practices in the mid 20th century, it is an ambitious and all encompassing project. One fascinating theme from the opening chapter are the maps of early ecclesiastical sites, which are significant given the associations the area has with St. Patrick. This chapter not only gives a detailed account of the early Christian settlements, it provides a great commentary on the evolution of cartography, from early tools for invading armies, and the territories of local Gaelic Chieftains to later natural history surveys. Subsequent chapters deal with the physical geography of the land, the farmers it attracted and the political and cultural allegiances they had. It combines beautifully to give a sense of what, and who gave the region its diversity, in terms of land use, and religious worship. Some points drift into the territory of memoir, not so much of the personal, but of the place, and this may a problem for the purist, nevertheless it is clear that McCorry has a long-standing affinity with the area. This however, does not detract from the obvious historical scholarship which informs the author’s appraisal of the locations examined within. Much is added to the overall picture by the author’s interest in the evolution from Irish to English of the various place names. This is complimented by the other historical and geographical sources which are utilised throughout. The author’s personal connection with west Down is evident in the personal anecdotes which dot the text. A later chapter examines the plethora of stone religious crosses and artefacts which adorn the area from Celtic to modern. Outdoor stone crosses have become almost something of a cliché when identified with Ireland. The author steers clear of such crudities. Without overstating their ‘Irishness’ nor venturing into the territory of the current buzzwords ‘a shared past’, in vogue with so much history with a modern political reconciliation tinge, it reveals a countryside still physically, and spiritually connected to its early common ancestry in terms of Christian roots. Chapter Five sees the Author revisit some of his best historical themes, the condition of the pre-famine poor of Ireland. This chapter focuses upon aspects relating to the 1833 Royal Commission on the Poorer Classes in Ireland and the 1843 Devon Commission: (‘Commission on Occupation of Land (Ireland)’). The importance of the background to the two commissions is explained, and bolstered with a list of those who provided oral testimony to the commissions from the Baronies of Upper and Lower Iveagh on the causes of low wages, rates of labourers. It reflects the harsh realities of life in what was supposedly a more prosperous region of the country. While the area had a more diverse industry and farming culture than many areas, it was still not entirely spared the ravages which befell the country. This work, alongside McCorry’s previous work on the Famine, as well as the likes of Gerard MacAtasney on the Famine in Lurgan and Portadown, provide invaluable insights into a region which has been overlooked somewhat in Famine historiography. The impact of the Great Famine on the mid-Ulster region has been overlooked. Subsequent chapters take the reader on a tour of the area known as Lagan Valley and Upper Bann Valley from the Medieval to the modern period. Throughout the various townlands one gets a sense of a forgotten earlier history. These areas had since the time of the Famine until the 1911 census provided much in the way of emigrants for various locations. What McCorry shows here is an important and again overlooked aspect of Northern local history. The emigrant has long been portrayed as a Southern or Western in popular history, and it is therefore unsurprising that it has been forgotten that large amounts of emigration took place within a prosperous region of Ireland. However, it wasn’t all desolation and emigration in the area. The Industrial revolution and the linen industry helped to shape many aspects of the area which are still visible to this day. McCorry’s depth of knowledge of Irish history from the Medieval to the modern is impressive. His knowledge of local history is just as impressive as that of his national history. This has the effect of placing this book neatly within the wider context of the country’s story, regardless of which period covered within. The depth of historical scholarship is undoubted. What is also clear is the author’s affinity with the area. This may not appeal to the purists, nevertheless it plays a significant part of the study. This book provides a welcome change in a region which has for too long been oversaturated with conflict studies on the more recent past. 10 Parkview Street, Lurgan, Co. Armagh BT66 8QL.